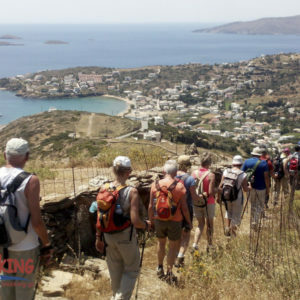 A unique hiking journey to two extremely beautiful but different Cycladic Islands. The Cyclades is a group of islands scattered over the deep blue waters of the Aegean Sea, cooled in the summer by the ‘Meltemi’ wind. One of the most ancient European civilizations was born and prospered here: the Cycladic civilization (3000-1000 BC). 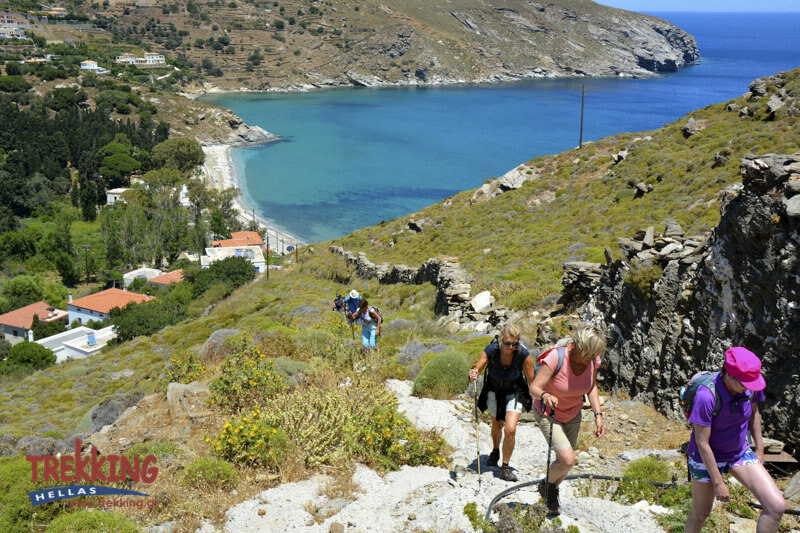 Although some of the Cycladic Islands are famous to the tourist crowds and the international jet set, there are a few that are still left to be discovered, from travelers that are seeking authentic vacation experiences: Andros and Tinos are amongst them! 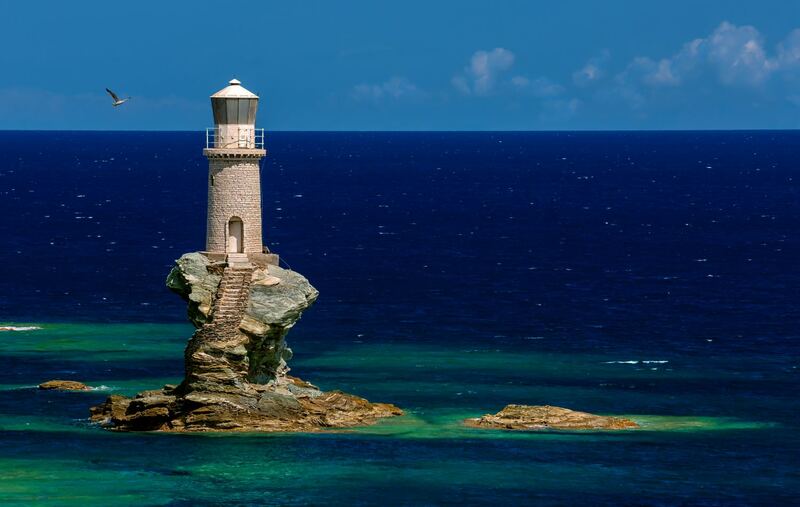 Andros is the most northerly island of the Cyclades and the second largest after Naxos. 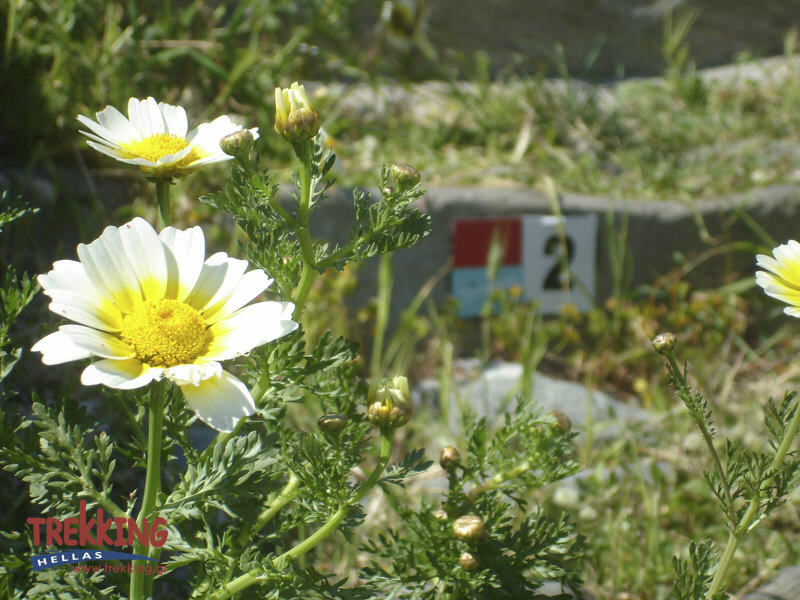 Thanks to its water springs it’s irrigated with plentiful running water and thus verdant with a large number of olive trees, pines and fruit trees. 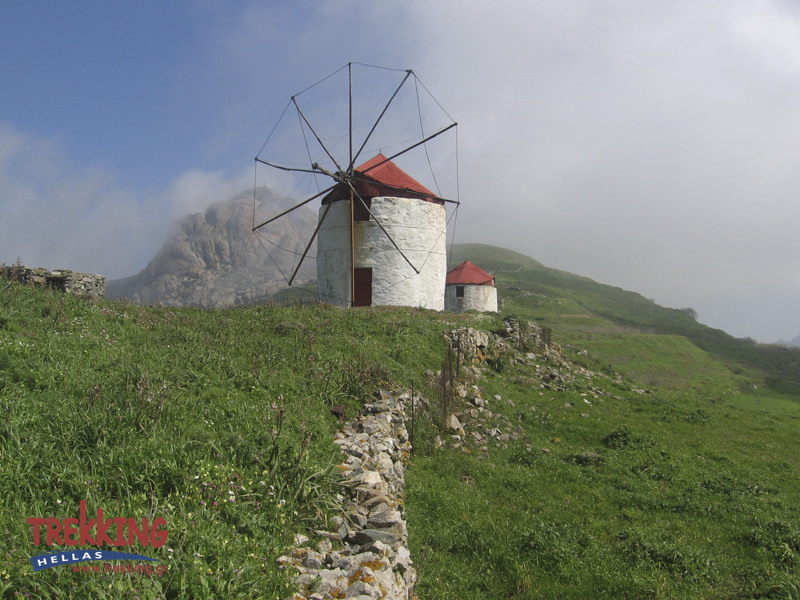 Tinos just one mile away, famous for its characteristic dovecotes, is full of picturesque villages and windmills. Tinos is today exactly what Delos Island was to believers in ancient times. 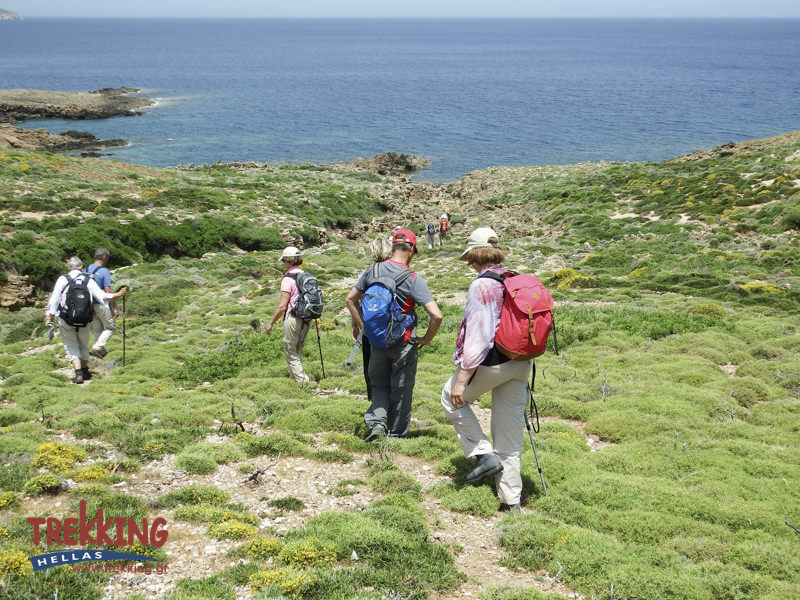 Twice a year, on March 25th and August 15th, pilgrims inundate the island to visit the famous church of Virgin Mary (in Greek: Panagia). 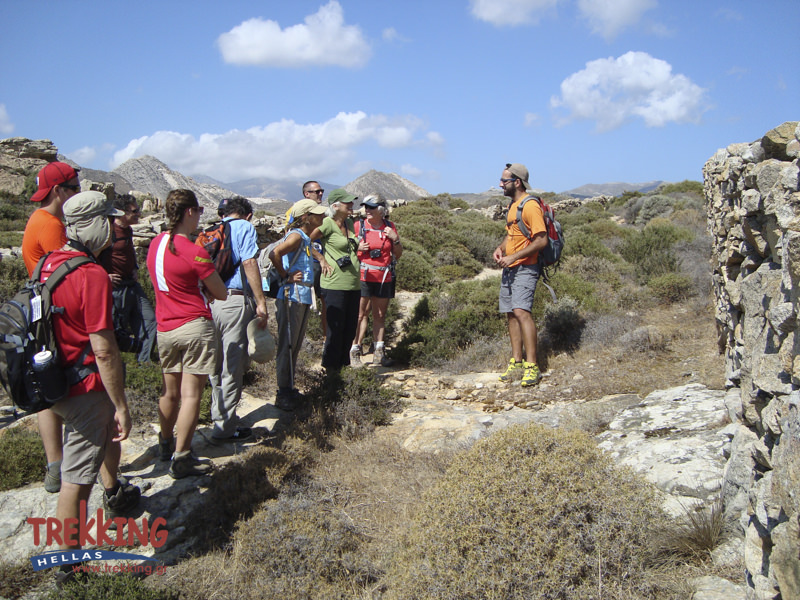 During our tour, we explore magnificent paths and trails with breathtaking views. 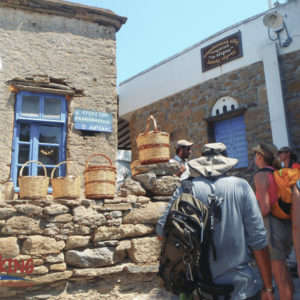 Discover traditional Greek villages, local craftsmen and the unique Cycladic architecture and history. We enjoy sandy beaches and beautiful sunsets. 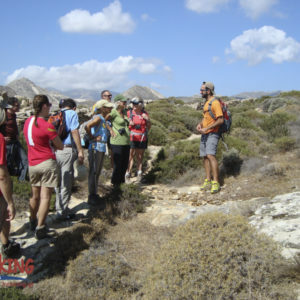 Relatively easy hikes and activities for beginners (3 – 4 hours per day), good start for a first outdoor holiday. 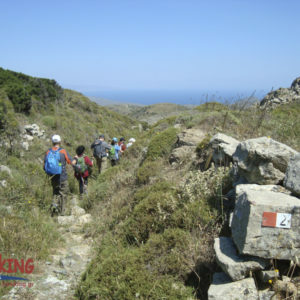 The walking is on a mixture of dirt tracks and well – constructed stone mule paths. 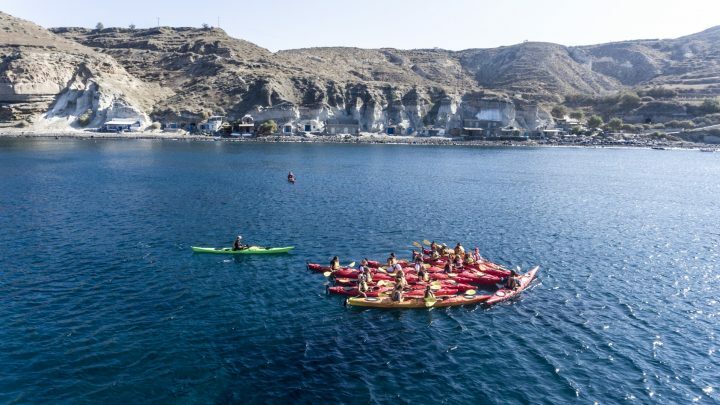 Our trips are designed for active people who enjoy energetic days. We expect participants to be in good physical condition. Arrival in Andros, transfer, and check-in at the hotel. We meet for the first time to get to know each other and have a small talk about the program, in a unique greek manner: with welcome drinks and small bites of Greek delicacies (mezes in Greek). Overnight in Andros. 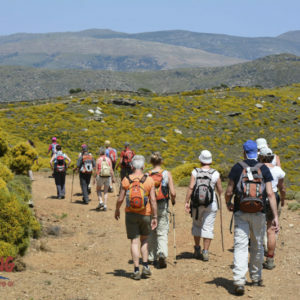 We take the longest route in the network, following the old path which connected southwest Andros to the central villages and Chora, the so-called “Ample Way” (Fardia Strata). 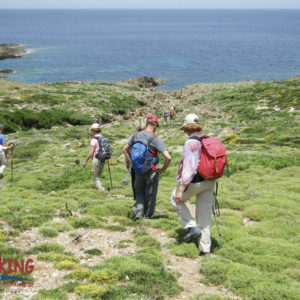 In the first part of the hike, we enjoy panoramic views to the west coast and the ancient port of Palaiopolis on an exceptional cobbled path with holy oak, wild olives and seasonal crops. En route, we pass by two small waterfalls the watermills of Melida and the Olive Oil Museum. We end up in the charming village of Pitrofos for an authentic gastronomic experience: a lunch with special local dishes. 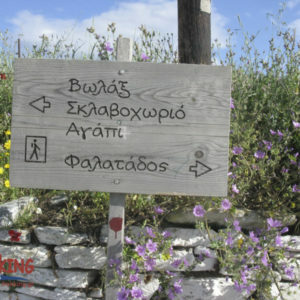 We start from Chora, for a beautiful circular hiking route. Around Gialia Beach we admire a unique natural environment formed by the river. 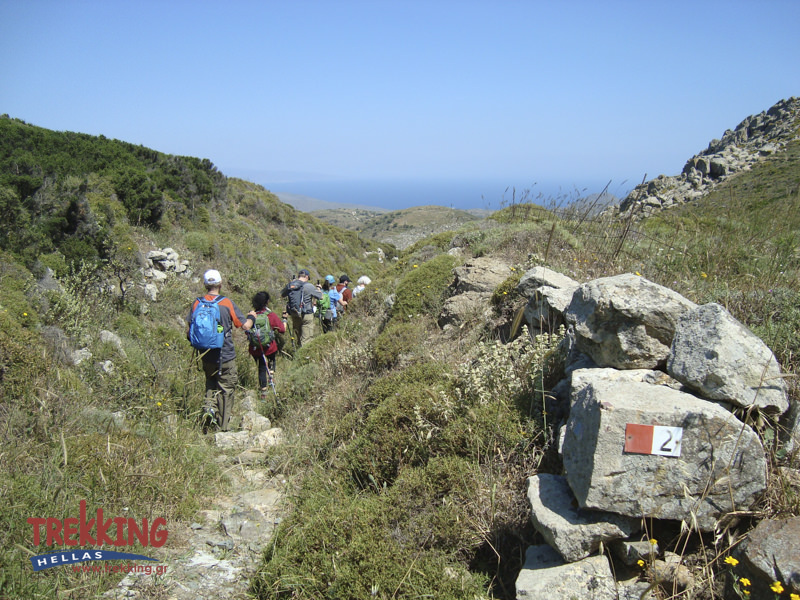 From there, the cemented footpath parallel to Pythara ravine goes up towards Apikia Village passing through major settlements of seamanship and rural Andros. 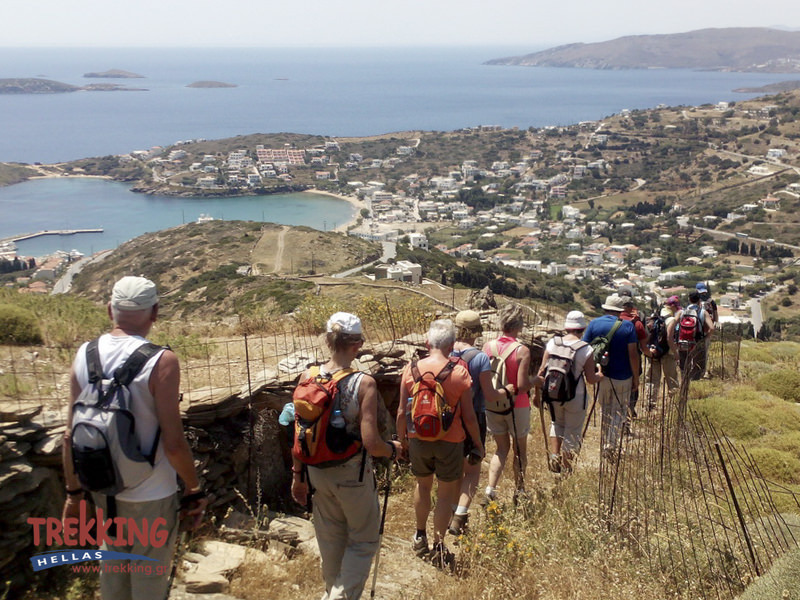 After some rest and a light lunch, we descend this time to Chora via a different excellent cobbled path, enjoying a magnificent view of the capital city and the sea. 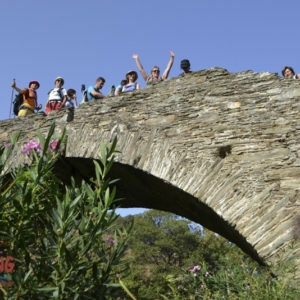 During our hike, we visit ‘the Fabrica’, an old pasta factory watermill, a medieval stone bridge, the Bistis-Mouvelas Tower dating from the 17th century and Pythara waterfalls. Light lunch during our hike to a local “mezedopoleo” and return to Chora. Stop for a swim and free time for rest or a walk to the center of the town. castles of the island on the central agricultural and commercial artery for south-eastern Andros until 1950. 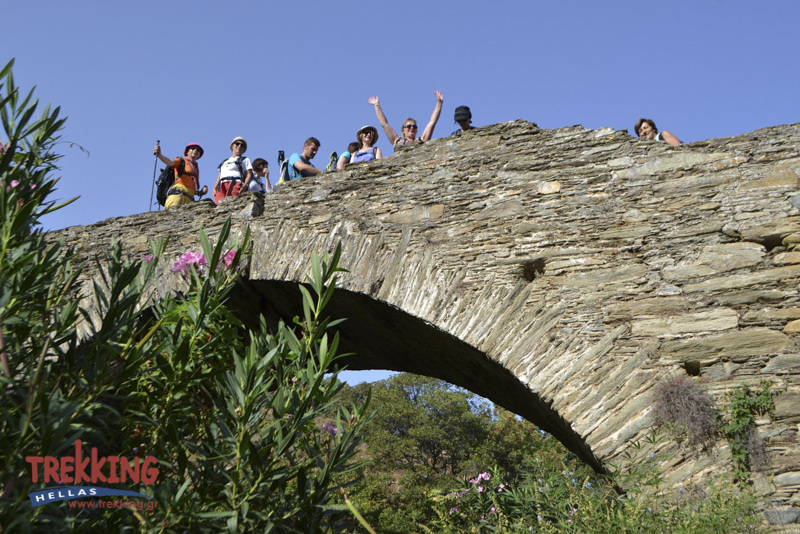 We cross Dipotamata ravine, a valley with impressive water mills, an arched bridge, and Kochylou medieval castle. 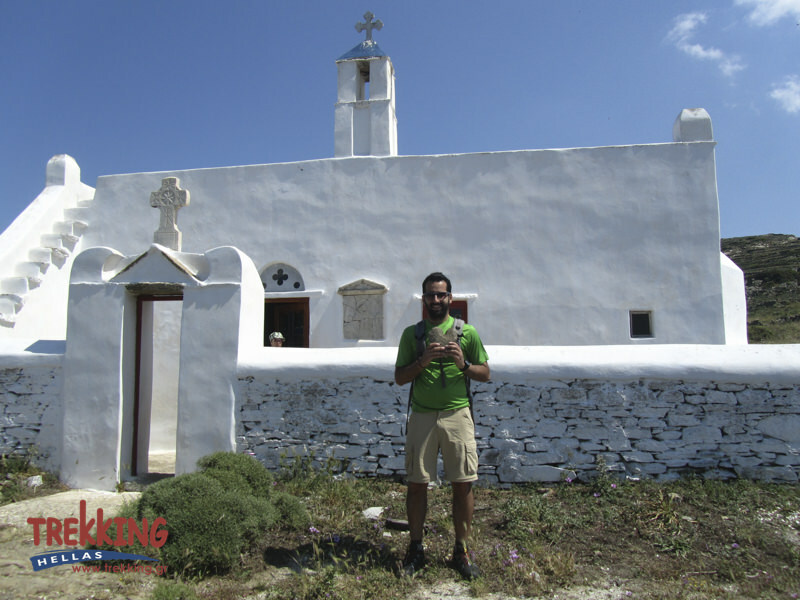 In the morning we transfer to the port where we take a boat to Tinos (2hours), the isle of dovecotes and small Catholic chapels. 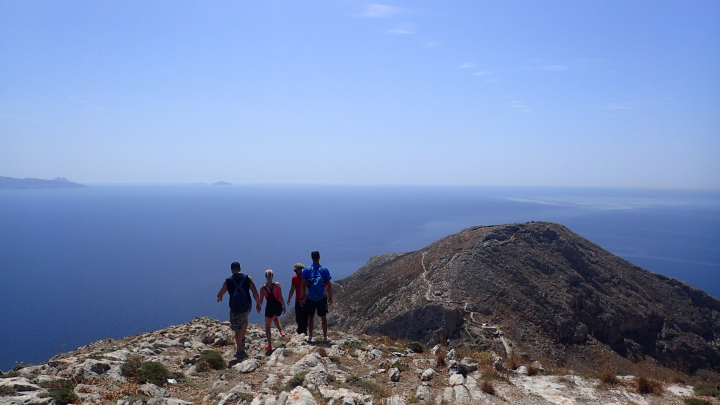 Having settled at our hotel, we have the rest of the day free to explore the town of Tinos. Don’t forget to visit the church of Virgin Mary in Chora. Tradition says that a nun, Pelagia, from the nearby convent of Kechrovouni had visions of Virgin Mary revealed to her the burial place of an icon. After intensive searching, an icon was indeed found, at the spot where the Church stands today. 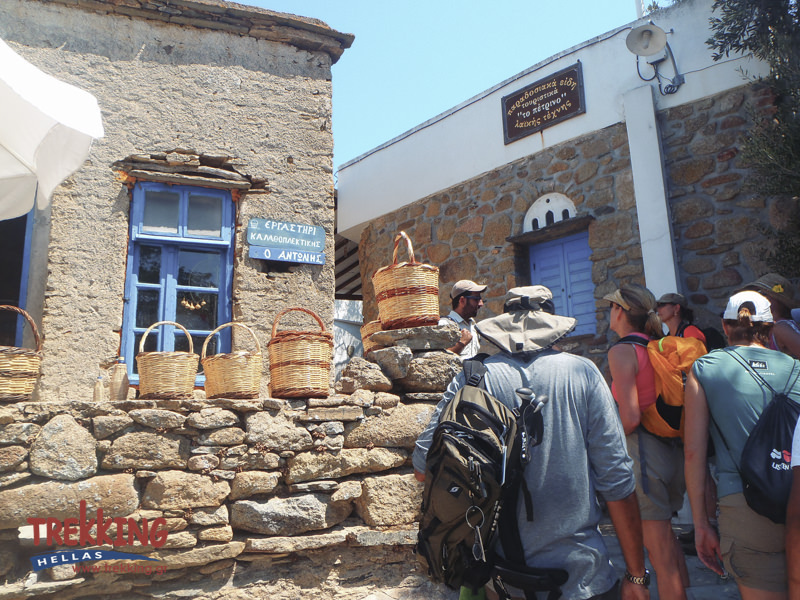 Today the icon is widely believed to be the source of numerous miracles and Tinos has become the center of a yearly pilgrimage that takes place on the 15th of August. Many pilgrims make their way the 800 meters from the ferry wharf to the church on their hands and knees as a sign of devotion. 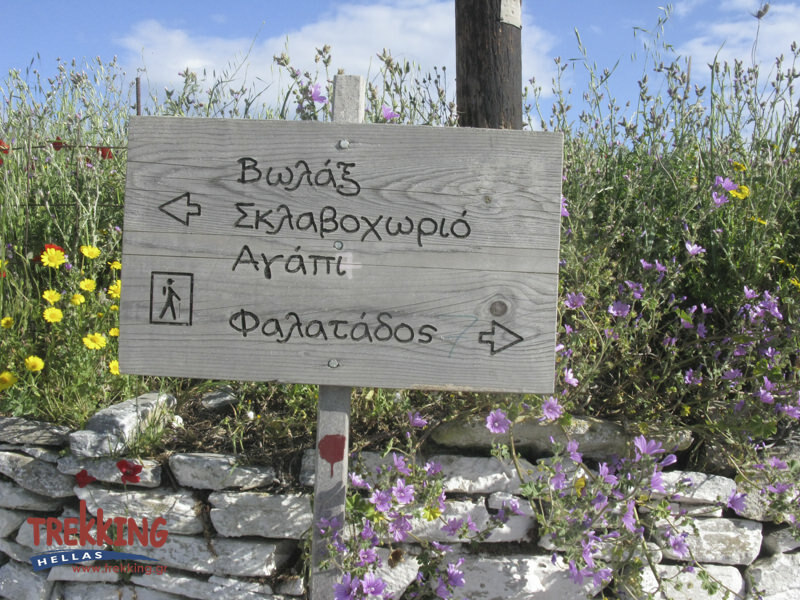 Today we discover the picturesque villages and dovecotes of Tinos. 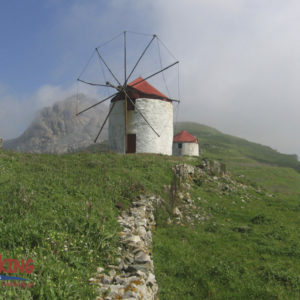 Following an impressive medieval paved path (kalderimi), we visit the old villages of Ktikados, Xatzirados and Tarabados, the heart of traditional dovecote architecture and we reach Kiona bay. Light lunch during our hiking tour at the traditional “kafeneion” at Ktikados. Return to Chora hiking or by taxi. Rest and swim in the evening. We go up to Xobourgo the old Byzantine fort of the island via an old paved path. The view of the Aegean is remarkable. 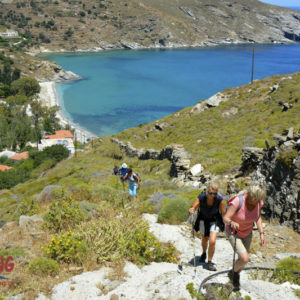 We continue walking down to Volax, an isolated, small, sparkling white village in the middle of a plateau surrounded by hills of round granite blocks and we return on to the village named Falatados the second biggest settlement in the island, with the imposing Cathedral and the famous House of Scetch. Please try to travel as light as possible. Although you do not need to carry your entire luggage while walking, you will still need to carry it over short distances. Also, remember you unpack and repack on most nights. 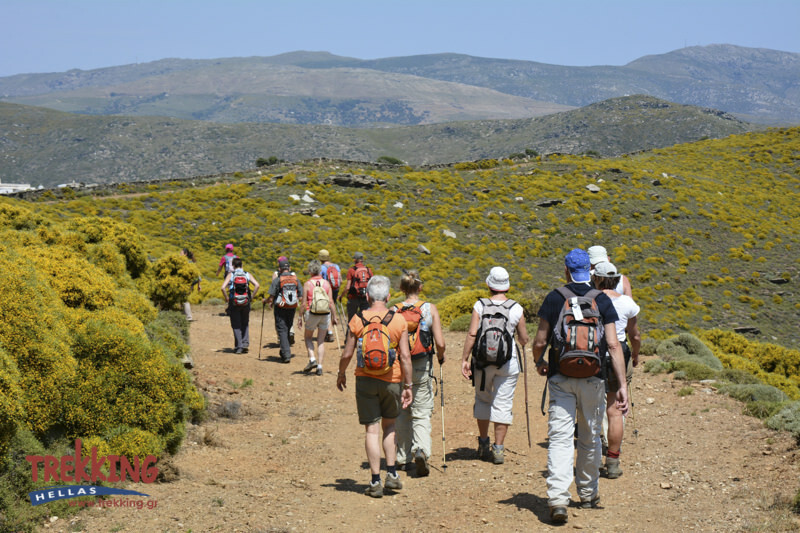 You can leave the luggage that you don’t need on the trek, at the hotel in Athens or in our offices. Good waterproof top (Gore-Tex recommended or similar) with hood. Your own personal water bottle (at least 1 liter). As part of our environmental policy and actions, we are committed to eliminating the use of plastic water bottles. 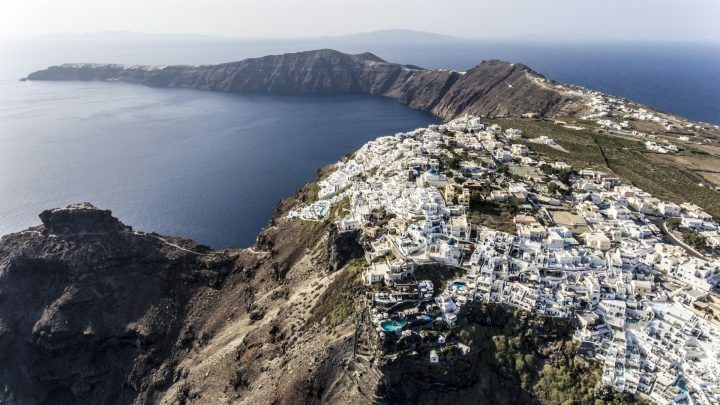 The Cycladic Islands enjoy a Mediterranean climate, with an average temperature for the year of 18-19 C. The winters are mild and the summers – by Greek standards- cool, thanks to the beneficial effects of the seasonal winds known as the “meltemia ”. Cycladic islands in summer with the naked rocks, the see plants and the total lack of vegetation combined with the deep blue of the Aegean Sea and the typical architectural style of the all-white houses, hide skillfully the wonderful secret of Greek nature: one of the richest floras in Europe and a large number of rare endemic plants, that will be found on the edge of rocks, on the most steep places surviving for centuries, unique, separated, isolated. Campanula laciniata, Muscari cycladicum, Campanula santorii, Centaurea oliveriana, the rare Fibigia lunaroides are only a few of endemic plants that can be found on Cycladic Islands. 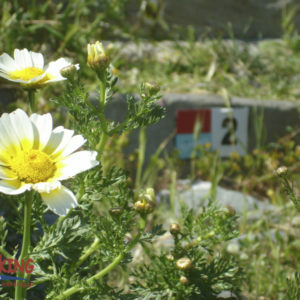 Cyclades flora is not only rich in endemic plants but also in aromatic species. It is very easy for someone to find them since these perfumes together with the blue and white are purely Greece. It’ s the perfume of thyme, sage, mint, summer savory, lavender, rosemary; it’ s the perfume of Greece. je vous ai compris !! !